Launching a heavy application for Android in India has its own complications. Further, problems increase for the consumers when the app is resource intensive like Uber’s. 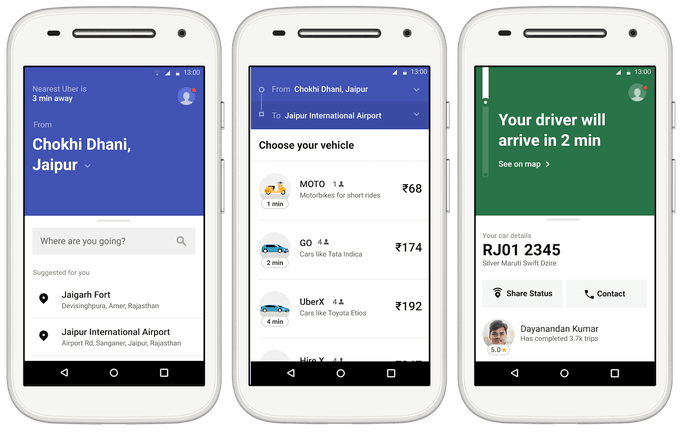 India being a big market for the American convenience giant, the company has now decided to bring a lite version of the original Uber application. The Uber Lite app which cuts down on the heavy animation and the default map view will prove useful for users who are low on storage and are on a slow internet connection. A big chunk of total smartphones sales in India are from budget devices which are priced around Rs 15,000. Usually, it is the case that consumers have to face issues like poor internet connectivity and low storage, in such cases the Uber Lite app is going to come in handy. Uber is claiming a 300-millisecond response time on the application and is also claiming support for all Android phones. Using GPS, the app will automatically detect users’ location, and there will also be a familiar textbox where they will be able to enter their destination details. Users will be able to see the closest available Ubers along with fare estimates, and options of UberGo, Pool, Premier, Moto, and UberXL. Users will also have the usual options of calling the driver and checking the ride status. It is safe to say that despite cutting on some bloat the Uber Lite app won’t lose out much on the important aspects of the application. Similar to the original Uber app, the lite edition will also learn to give smarter recommendations to the users based on usage habits. Even though in this version the map option is not visible by default to the users they will have the option of toggling it on or off if they wish to see the actual route. Uber is also reportedly working on a progress bar to track rides along with supposed development on local language support. This move by the USA based company comes after Ola, which is the home-grown cab company of India, launched its lite version of the app sized at only 580KB. Although the Uber Lite app is not out yet for the users, interested people can sign up for an early access. Whats the meaning if they bans anyone at anytime? My id is blocked without doing anything. Create a new ID with you new number. Change your number to previous one. booking can not be done using my id. they could not solve it. when new account is being opened using another number, they disabled it. could not book for a few weeks.